If Brauchler really is concerned for "how can we really help people and keep them from hurting themselves and others, whether it’s by a gun or a car or whatever,” perhaps he should have stayed in the race for Governor. Or perhaps run for the state legislature, where budgets that allow government to "help people" are developed. Attorney General doesn't seem to have a great deal of leeway to "help people" in that way EXCEPT for taking away guns or securing the people so they can't get to their guns (civil commitments). And I've read Colorado doesn't have sufficient mental health resources now for commitments and treatment, let alone adding to the number for all those threatening to hurt themselves or others. My priorities may be a bit skewed, but I think it may be better to limit 2nd Amendment rights a bit than to limit 4th Amendment rights by arrest or other detainment, or 5th Amendment rights to liberty. Those who have not been driven out of their own home by a manic gun nut don’t get to preach to me about how gun owners who choose to menace and threaten people deserve "due process". He or she who has not feared for their own or their children's lives because of a well-armed psychotic, cannot come preach to survivors about how the 2nd Amendment is the only amendment worth defending, and how their right to own as many guns of the types of their choice is much more sacred than my right to life, liberty, or happiness. 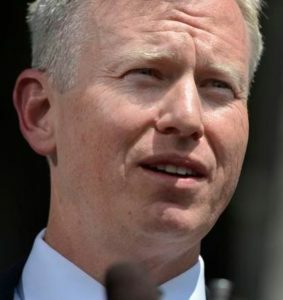 Brauchler's duty as Colorado DA, is to protect public health and safety and to bring appropriate consequences to criminals who have threatened public health and safety. Everything else is just more distraction, straw men, and dissembling in service of a business model that depends upon unlimited gun ownership and “concealed carry everywhere” permits in Colorado. April 2018: Broccoli knew his sworn duty when he supported House Bill 18-1436, posing in front of a wall of law enforcers to endorse the Extreme Risk Protective Orders Act. Said our brave DA / AG wannabe: "I'm done crossing my fingers and I'm done hoping." Somehow, September 2018 Broccoli forgot all about that when he decided that he needed support from Rocky Mountain Gun Owners. Or at least for them to stop bashing him for being a "gun grabber". Someone needs to explain to Boy George that you pander to the ideological fringe of your party before the primary or convention, not after you've won the nomination. That is when you pivot to the center. At least he's consistent: inept at being a prosecutor, inept at running for Governor, now just proving he's an inept candidate for AG too. Shh, R&R! Don't help the little weasel. Brauchler changing his tune? Imagine that. Boy, did not see that one coming. Why would he change his tune now? Is he afraid you guys are going to vote for Weiser? Well I bet he wants to separate himself from Weiser's position. No point being on the same side as your opponent on such a divisive issue. Unless there are more votes there. Just sayin'. That would leave one to believe Weiser should change his position as well, and tacitly implies more people are against this proposal than for it. Just sayin'. The problem is that many who support the legislation do not often vote, or under-vote. The people who oppose – like Negev – always vote up and down the ticket. It's actually not a divisive issue. Most people do not want violent or mentally disturbed people to have unlimited access to guns. Um, nobody wants violent or mentally disturbed people to have unlimited access to guns. You fail to elaborate on your link, that most people (in Massachusetts) favor the red flag law, but only 8 states (not most)(few) have such a law. Apparently most people favor due process. let's see … credible complaint as measured by police. short term follow up in front of a judge (within 2 weeks in the jurisdictions I read about). People can argue their position, and in some cases demonstrate competency clearly enough the judge removes the red flag, and the person gets guns back. middle term — most bills have allowed a person to petition the judge for another hearing. longer term … guns are returned after a set amount of time (usually a year) UNLESS there is a further complaint, which can start the clock again. So, where is the lack of due process? And as for 8 states: in May, 2018, LA Times said, "Nine states now have such laws on the books and dozens of others are considering such proposals. " A day ago, Progress Texas said "Thirteen states have passed Red Flag Laws and 29 others have considered such legislation—but sadly, Texas lags behind." Seems like there may be a trend or something. Having to prove your innocence for a crime uncommitted based on the opinion of a family member or law enforcement and losing the ability to defend yourself (legally) before your rights are removed is a violation of due process. Someone "red flagged" isn't proving innocence — they are proving mental competence to have weapons and use them responsibly. Just as some people have driving licenses taken away after having a seizure, some people are arrested for appearing intoxicated, or (as I mentioned elsewhere), some people have assets stripped from them because they appear to be the proceeds of illicit activities. And "red flag" laws have been in existence for several years. Where is a court determination of the loss of due process? All schools now do "threat assessments" all the time, as adolescents still tend to be moody, depressed, angry, and hormonally driven. When said adolescents are also making specific threats to specific people and have access to weapons, appropriate protective consequences ensue. Most mentally ill people are not violent, and are more likely to be victims of violence than not. This also is well known by justice professionals. It is the very few who are mentally ill, fanatical, violent, and armed that we are concerned with. The whole parole and probation divisions of the criminal justice system are based on the assumptions that someone who has committed a crime in the past may do it again, and that the perpetrator must be monitored and constrained from certain activities, such as shooting a gun for sport. You may not like it, but limiting the rights of a few to preserve public safety for the many is very far from a new concept. The law for restricting the possession of firearms by individuals convicted of a misdemeanor crime of domestic violence has been in effect since 1996. Adolescents are unable to own firearms. If you find the "appropriate protective consequence " is to strip the rights of the adult, who exhibits no specific threat, you have gone one step further than red flag and have allocated blame to an innocent person not even associated with the threats. If you are concerned with the few fanatically armed, get a restraining order, which prohibits the availability/access to firearms. This can be done on emergency basis. Parole and probation based on someone who has committed a crime is indeed, not new, and if you have legally been prohibited from possessing firearms I make no argument. The red flag law is not that. It is the assertion you may, in the future, possibly be suspect to potential crime for an action you did not commit that crosses the line. Every instance you illustrate has had preventive measures in place already, for decades. It's understandable that you don't understand due process. It's buried way down there in the 14th amendment, and we all know you stopped reading after the 2nd amendment. As Trump once said take the guns away from them and let them go to court to demonstrate that they are fit to have them. If so, then give them back. Ah yes, the 14th… you wanna have to explain to a judge that you are mentally competent to have an abortion when your stepdad is pro-life? Slippery slope. Apply the logic of red flag laws to a right you value and you will see the flaw. You DO know that minors may well have to demonstrate to a judge a credible fear of abuse or some other cause in order to be able to get an abortion, right? And those laws have been upheld time and time again. There are a number of other laws around abortions that limit the right of adults until some standard is met. It may concern good or bad policy — but "due process" is not a libertarian "get out of regulation free" card if the legislature passed and the executive signed the law, and there is opportunity for judicial review. I do know this. Minors cannot own firearms, period. Show me the standard that an adult has to prove they are mentally stable to gain access to an abortion. Minors cannot own firearms, period. Last I checked, that statement wasn't even within hollering distance of being true. Got a cite? …Its been federal law since 1968. Unlicensed persons may sell, deliver, or otherwise transfer a long gun or long gun ammunition to a person of any age. That's the federal law. Laws in some states prohibit persons under a statutorily specified age from owning any firearm, but Colorado ain't one of 'em. Thus, the statement "Minors cannot own firearms, period" is false as a simple matter of fact. Colorado is one of them. Unlicensed persons are unable to transfer a firearm to a person of any age without undergoing a background check, which is performed by a licensed dealer under federal law. That is a simple matter of fact. Well, at least you've abandoned the patently false notion that federal law categorically prohibits minors from owning any firearm. That's progress. Find a Colorado statute that contains such a categorical prohibition and we'll talk. Protip – C.R.S. 18-12-112, the statute you're referencing, doesn't get you where you want to go. In any event, I think we can all agree that the statement "Minors cannot own firearms, period" is untrue. Federal law contains no such prohibition, and the Giffords Law Center article you cited upthread shows that multiple states allow minors to both possess and own firearms (rifles and shotguns only in some of those states, all firearms in others). I'm not sure how C.R.S. 18-12-112 doesn't get you there, but I will gladly stand corrected. I somehow thought it was illegal to sell assault rifles to children. While I am a bit disheartened that you got me on this, I wonder, could you walk me through the process of legally getting an 8 year old ownership of an AR15? I'm asking for a friend. As a kid, I owned several .22 rifles and a .22 pistol, all before I turned 18. It's common on farms. I also had a .38 automatic I bought when I was 18. In fairness to Negev, I would have been 23 when the law he cited was passed. However if you purchased a firearm after 1968 and were under the age of 18 you violated federal law. As I said, I was born in 1945 so was 23 in 1968. But gun culture was,and is, pretty casual in rural areas and I bought most of my guns from other teenagers. I had a rifle I inherited from my father, a 22 Remington I still have. My apologies my post came in after you edited yours to include your age at the time. No problemo, Negev. Tell them to take the bullets first! How is abortion relevant to a thread about guns? 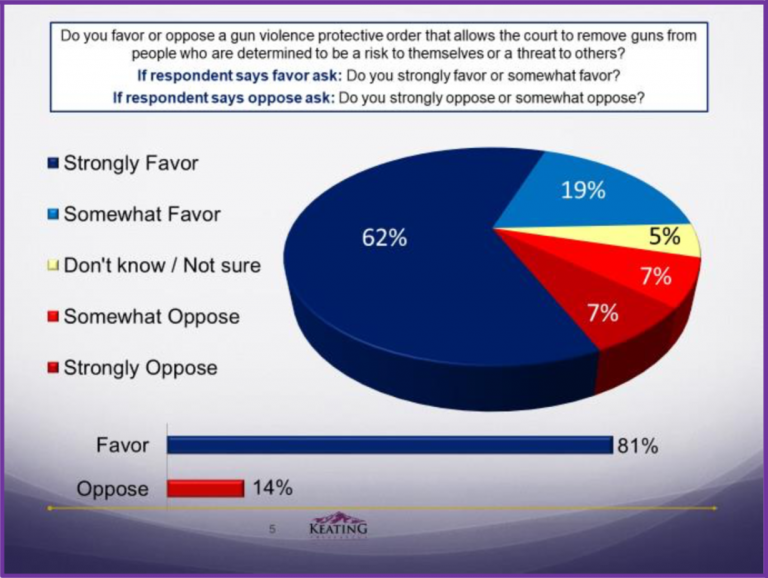 It's an equally protected Constitutional right that many here support, which if the same proposed type law were to be applied most would oppose. Feel free to insert any right you feel near and dear. Let me put it this way, CHB. If my daughter needs an abortion because of you, you will soon learn why the subject of guns is relevant! Voyager I concur with you 100% however your statement alone could be grounds for removal of your firearms under the red flag law. Actually, 13 states (plus the District of Columbia) now have "red flag" laws regarding removing firearms from those dangerous to themselves and others. Connecticut and Indiana were the first and have had those laws on the books for a number of years. California enacted it just a few years ago. Washington voters approved it by initiative (69% to 31%) in 2016. This year a number of states enacted it following the Parkland massacre. In May 2016 Colorado Ceasefire hosted a forum with the Coalition to Stop Gun Violence for about 100 people — mostly psychologists, social workers, prosecutors and law enforcement – on this concept, and pushed the legislation forward this year because the fatal shooting of Deputy Zackari Parrish could have been avoided if this sort of law had been in place and utilized by the family of the shooter (his mother had at one time taken the shooter's guns away). It is unfortunate that the Republican Senate leaders (especially disappointing was that the ambush of Deputy Parrish occurred in the senate district of Majority Leader Chris Holbert) were more receptive to the siren song of the Rocky Mountain Gun Owners than to the druthers of the populace (Polling shows 81% of Colorado voters and 77% of Colorado gun owners support "red flag" legislation – in Colorado it is called "Extreme Risk Protection Orders"). For many years, pistols were referred to as revolvers or "automatics". Of course they were semiautomatic, not full automatic. It's a faux distinction because about 20 years ago gun nuts tried to discredit their critics by pretending to have this great expertise, namely by harping on the supposed distinction between automatic and semi-automatic. Read any literature of the period, like the Mickey Spillane books, and you'll learn Mike Hammer carried a .45 automatic. I think the only semi-auto .38 pistol at that time would be the S&W Model 52. That caliber is rimmed cased and hard to function in semi auto platform. .38 super much different story. Still have it? I would love to buy it. It was a Spanish import, a Star, that apparently once served the Franco dictatorship. Shot ordinary .38 Sand W.
Sadly it was lost or stolen about 50 years ago. I think the late actress Mae West said it best: "is that a pistol in your pocket, or are you just glad to see me."